Benten Kozo, Benten Kozo Kikunosuke. Onoe Kikugoro was born on October 2, 1942 as the eldest son of Onoe Baiko VII. 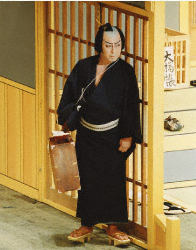 He made his stage debut under the name of Onoe Ushinosuke V in the role of the young apprentice in the pleasure quarters (kamuro) in Sukeroku Kuruwa no Momoyogusa at the Shinbashi Enbujo Theatre in Tokyo in April 1948. He studied dance under Fujima Kanso II and Fujima Kanemon IV (Onoe Shoroku II). At the age of 22 he took the name Onoe Kikunosuke IV in the role of Soga Juro in Kotobuki Soga no Taimen (The Soga Brothers Confront their Enemy) at the Kabuki-za theatre in May 1965. 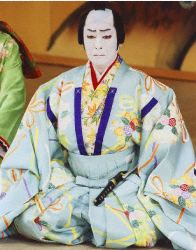 He achieved widespread popularity as a result of starring on television in the year-long NHK historical drama Minamoto no Yoshitsune in 1966, and he began to take roles in which his father Baiko had excelled such as Yoshitsune in Kanjincho (The Subscription List) and to perform dances such as Fujimusume and Kyoganoko Musume Dojoji at the Toyoko Theatre, which had become the training ground for aspiring top-ranking actors. 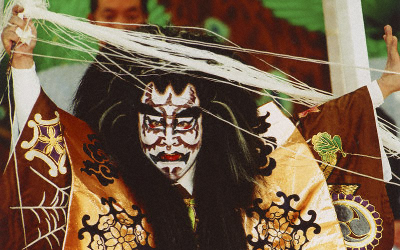 In October and November 1973 he appeared at the Kabuki-za under the new stage name Onoe Kikugoro VII in the roles of Benten Kozo Kikunosuke in Benten Musume Meo no Shiranami and of Sukeroku in Sukeroku Kurawa no Momoyogusa. 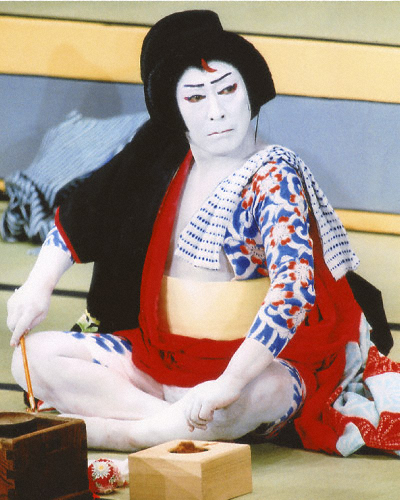 During the late 1980s he moved from onnagata female roles to tachiyaku male roles and gained a reputation as an actor who epitomises the spirit of Edo in both sewamono and historical dramas through his renditions of roles such as the fishmonger Sogoro in Mokuami's Shinsara Yashiki Tsuki no Amagasa and Tadanobu in Yoshitsune Senbon Zakura (The Thousand Cherry Trees). He became head of the Kikugoro troupe following the deaths of Shoroku II and his father Baiko. He has a well-established reputation as a versatile (kaneru) actor who has mastered the leading male and female roles including Naojiro and Michitose in Yuki Kurete Iriya no Azemichi. He has also made major contributions to the revival of plays not performed for many years such as Kanete Kiku Yanagisawa Sodo, which was presented at the National Theatre in Tokyo in 2004. 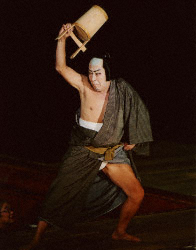 He is also engaged in activities aimed at ensuring that the classics are handed on in the correct, orthodox manner, and in this capacity has performed the roles of Enya Hangan and Hayano Kanpei in a full performance of Kanadehon Chushingura (The Treasury of Loyal Retainers) in February 2007 and of Sato Tadanobu in a full performance of Yoshitsune Senbon Zakura in March of the same year. 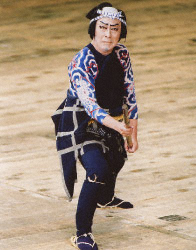 In the adaptation of Shakespeare's Twelfth Night by Yukio Ninagawa that received its first performance in 2005, he played the two roles of Maruo Bodayu (Malvolio) and Sutesuke (Feste), thus contributing to a stage performance occupying a unique position in the history of Shakespearean theatre. 1985: Arts Encouragement Prize of the Minister of Education. 1986: Japan Art Academy Prize. 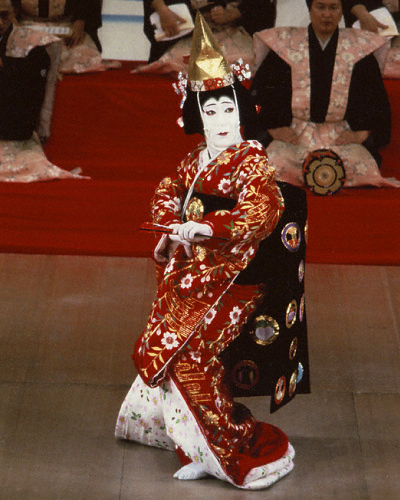 1990: Awarded the Grand Prix at the 11th Matsuo Performing Arts Awards. 2000: Elected as a member of the Japan Art Academy. 2001: Awarded Outstanding Male Actor Prize at the 9th Yomiuri Theatrical Awards. 2003: Designated a Living National Treasure (Holder of Important Intangible Cultural Properties). Musume Dojoji (The Maiden at the Dojo Temple), Hanako. Sakanaya Sogoro (The Fishmonger Sogoro), Sogoro. Tsuchigumo(The Monstorous Spider), Tsuchigumo(The evil sider). Migawari Zazen (The Substitute), Yamakage Ukyo.